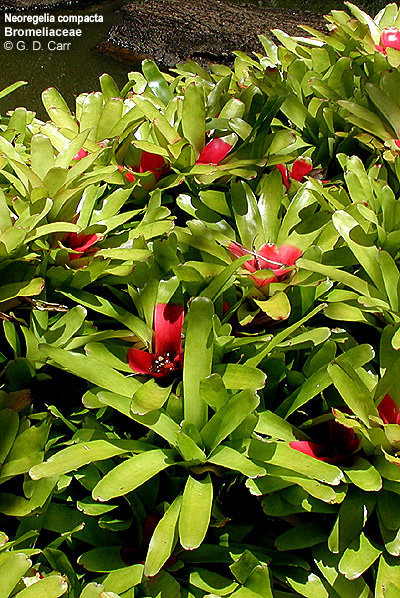 The Bromeliaceae are epiphytic herbs or sometimes terrestrial xerophytes comprising about 45 genera and 2,000 species that are further characterized by the presence of conspicuous floral bracts and scurfy, stalked, peltate scales on the leaves and other plant surfaces. The leaves are alternate, parallel-veined, usually stiffly lorate or strap-shaped, and troughlike, with a sheathing base and commonly with spiny margins. 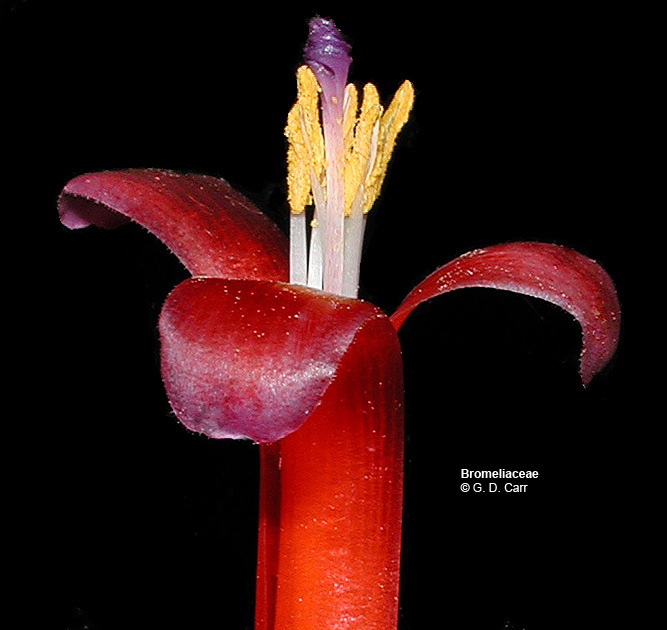 The flowers are usually bisexual and actinomorphic but unisexual and weakly zygomorphic forms are known. The perianth is in two dissimilar series, each with 3 distinct to basally connate segments. 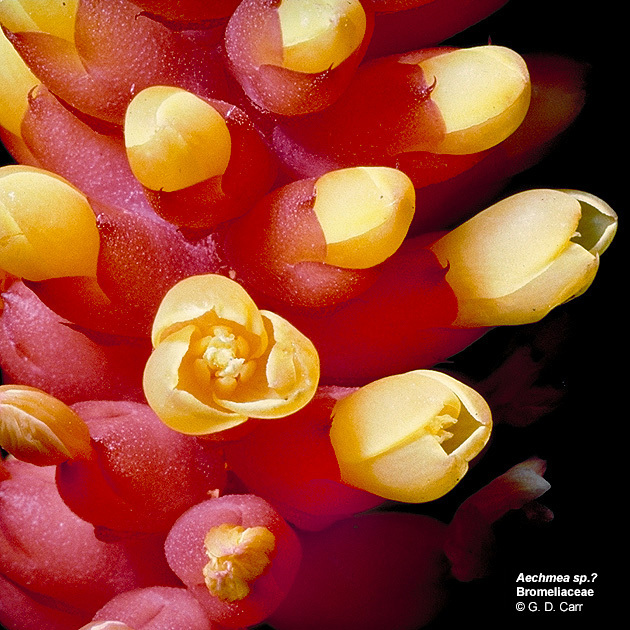 The calyx is usually green but not uncommonly petaloid and variously brightly colored. The corolla is typically brightly colored and often the segments bear a pair of basal, sometimes nectariferous scales. 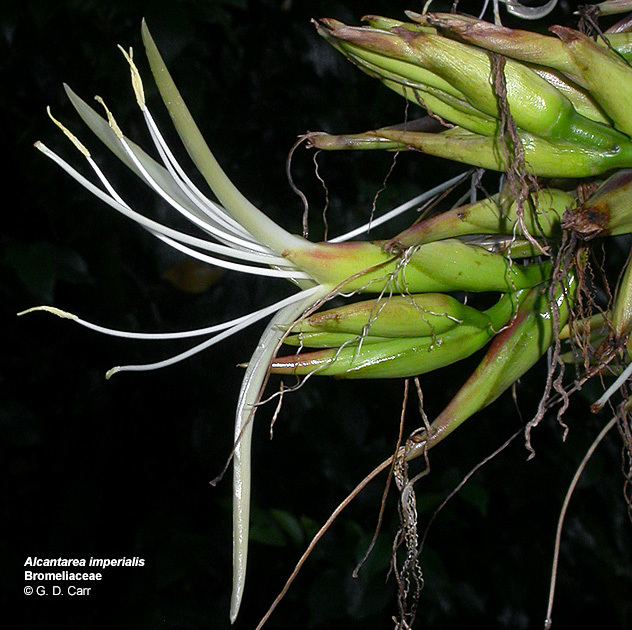 The androecium consists mostly of 6 stamens that are distinct or basally connate, and attach to the receptacle or are adnate to the base of the corolla. The gynoecium consists of a single compound pistil of 3 carpels, one style with 3 stigmas, and a superior to inferior ovary with 3 locules, each containing usually numerous axile ovules. The fruit is usually a berry or capsule. 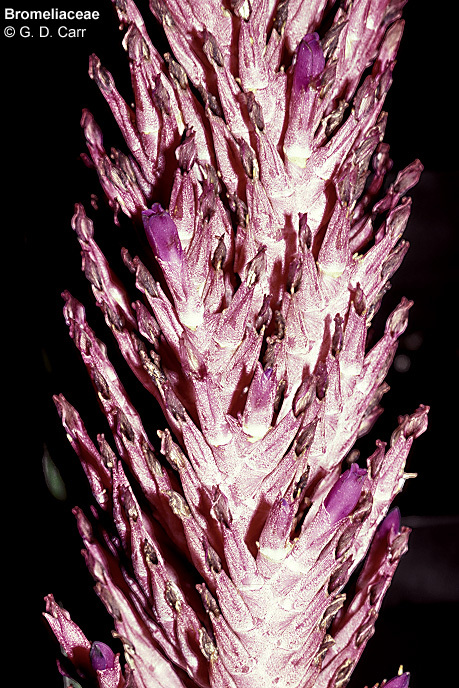 Aechmea gamosepala, cultivated, Lyon Arboretum, Honolulu, HI, May, 2004. 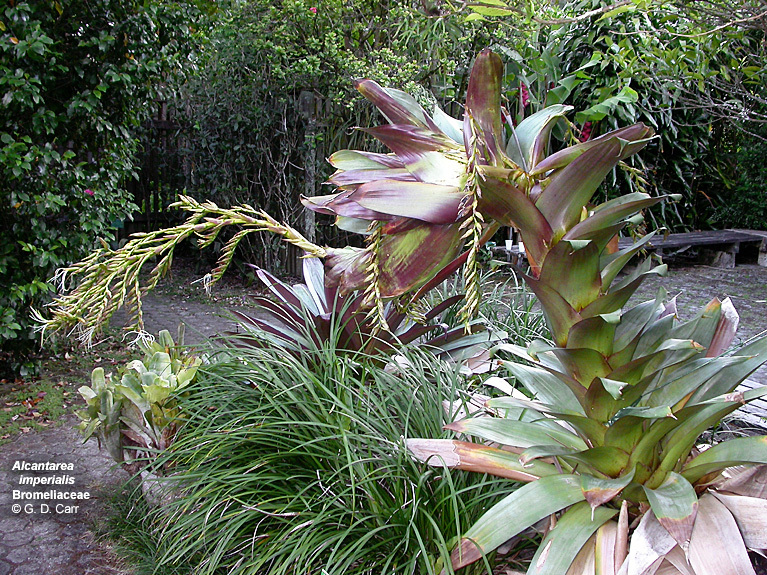 Alcantarea imperialis, specimen with rather deformed inflorescence, cultivated, Lyon Arboretum, Honolulu, HI. 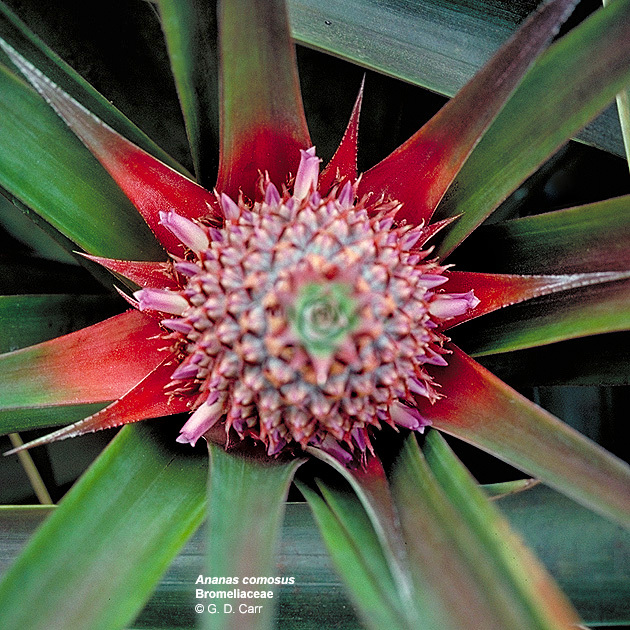 Ananas comosus, pineapple. 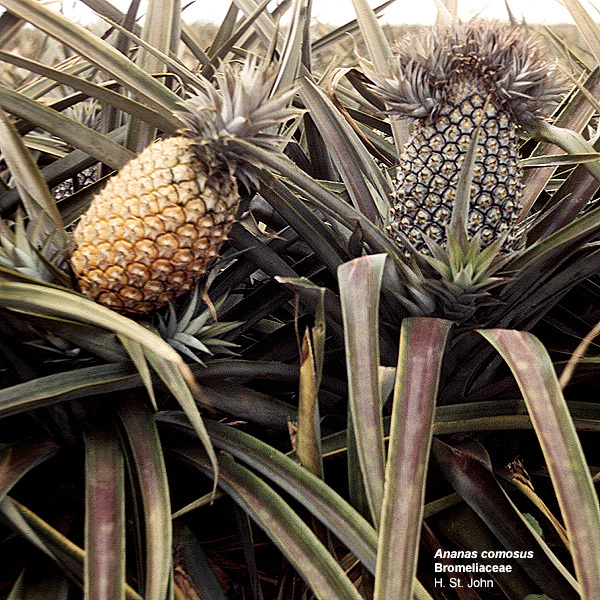 The pineapple is still an important cash crop in Hawaii. 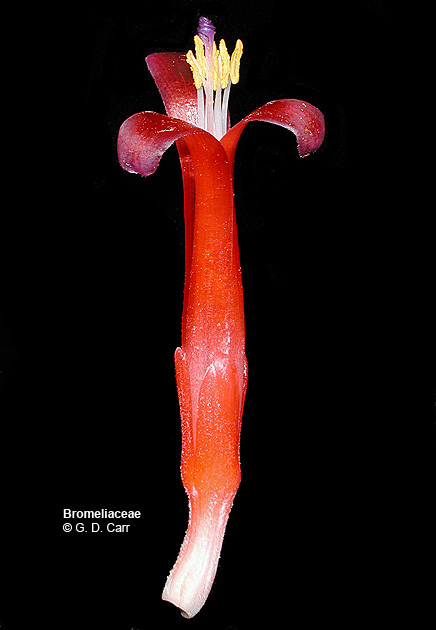 Note the troughlike, strap-shaped leaves and the reddish bracts associated with the flowers. 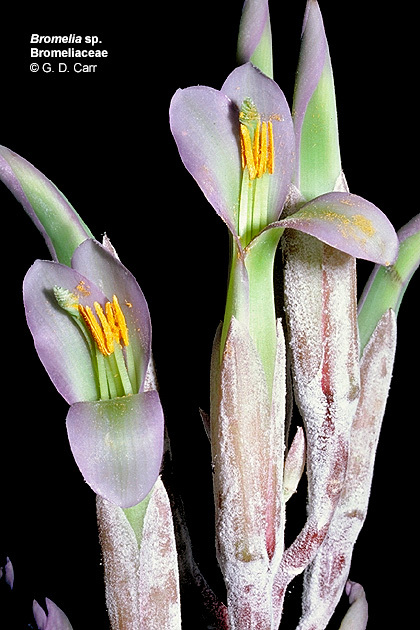 In this species the ovaries and perianth segments of adjacent flowers become coalesced into a multiple accessory fruit. 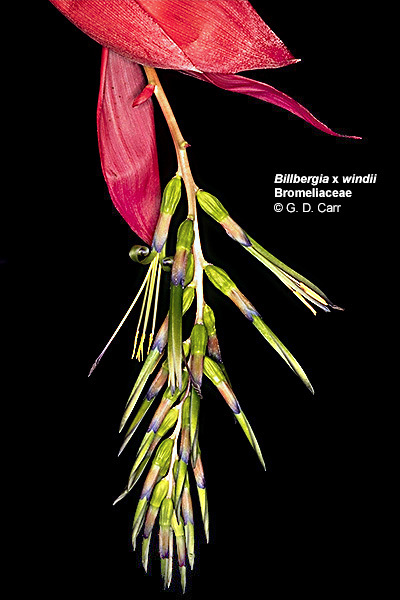 Billbergia x windii, note bright bracts, 3-merous perianth in two whorls, and 6 stamens. 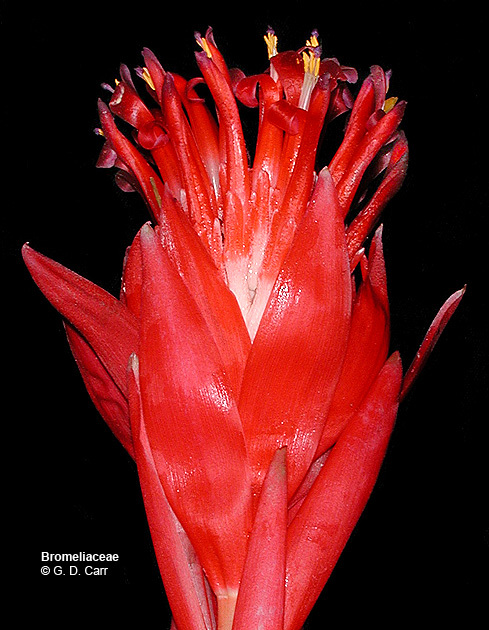 Bromelia sp. 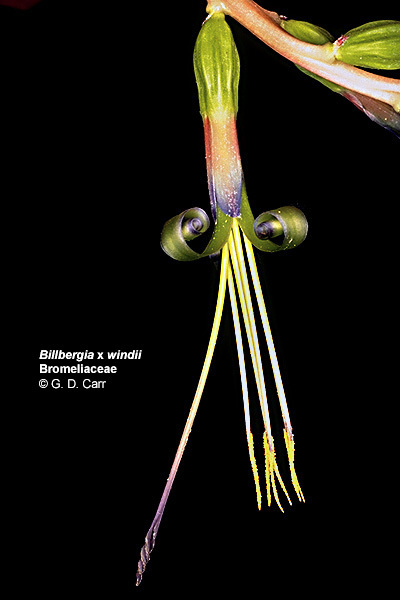 Note the 3-merous perianth in two distinct whorls, and 6 stamens. The whitish scurfy substance is made of peltate scales. The stigmas are spirally twisted together. Neoregelia compacta, blushing bromeliad. Compact, erect herb to about 1 foot tall. 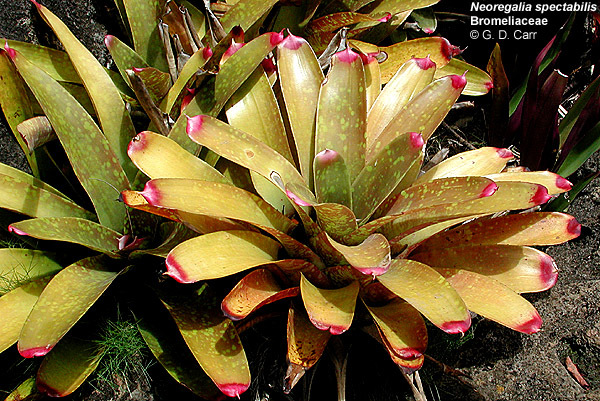 Neoregelia spectabilis, fingernail plant. 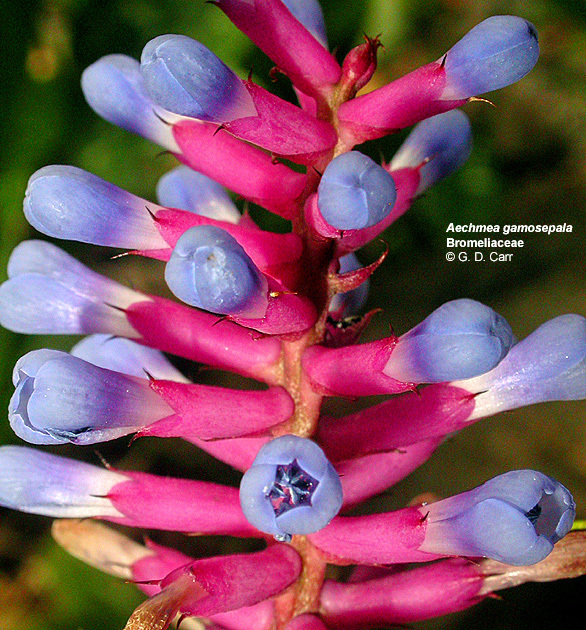 Erect herb from Brazil with red-tipped leaves about one foot long and one and a half inches wide; flowers blue. 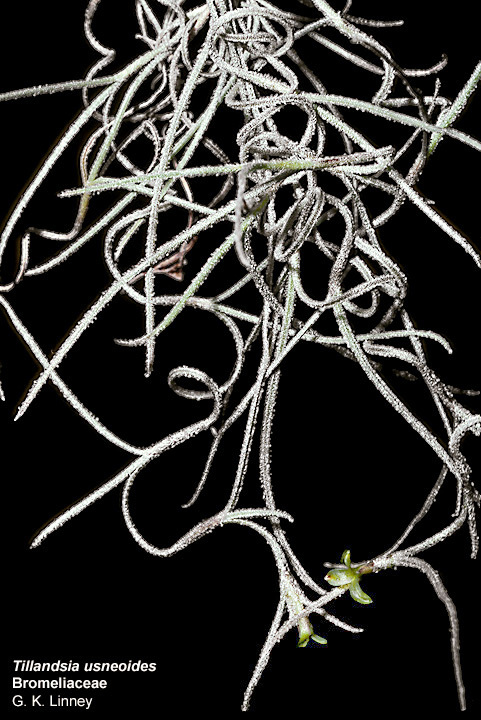 Tillandsia usneoides, Spanish moss. The trimerous perianth and peltate scales are very evident in the close-up photo. 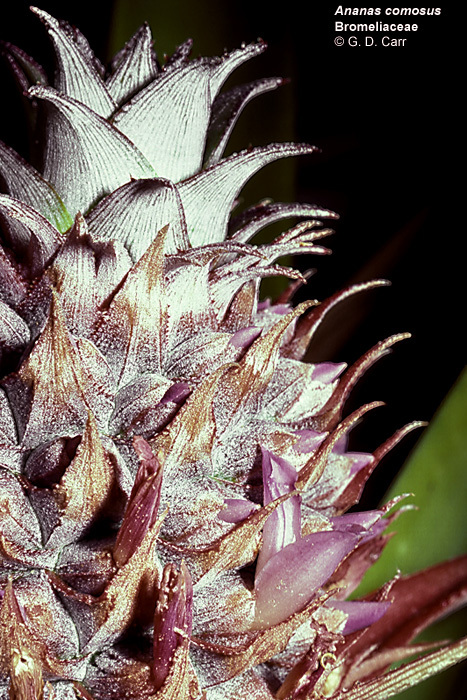 Aechmea sp.? 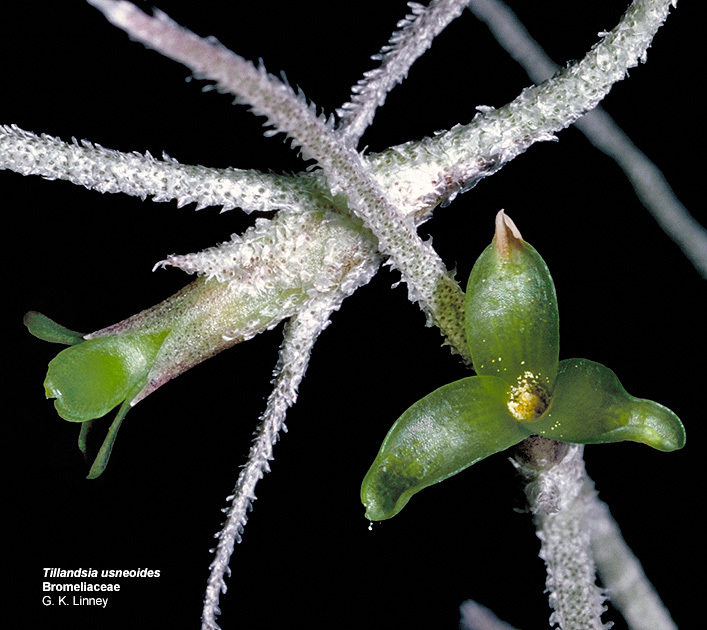 Although the calyx is somewhat petaloid in this species, it is still quite unlike the corolla. 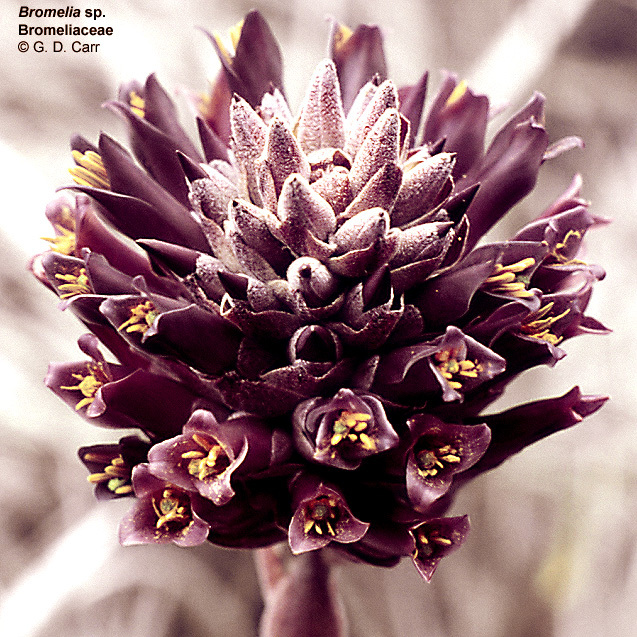 Reddish bracts are also associated with the flowers.